Indeed brand marketing requires the selection of a distinctive color scheme to help differentiate your company. A firm that seeks brand identification should be adamant in enforcing its brand standards and paying special attention to color. There should be a distinct PMS color(s) associated with the brand. PMS refers to the Pantone® Matching System. 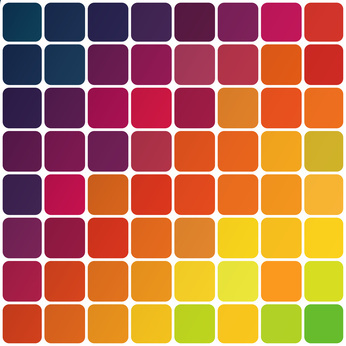 These are ink color color call-outs which relate to a specific color swatch. Branded color needs to be consistent and rarely vary. The corporation that uses strict brand standards should make sure that all publications use the correct PMS color and that it is printed at the proper density on all materials. A skilled design firm can specify swatches for 2 and 4-color printing and uncoated and coated stocks. You will also need a hexadecimal color equivalent for use on the web. In short, color needs to be consistent across all platforms. Look to major brands for their color schemes. The dark rich green of Starbucks, the cool yet strong blues of Chase bank, the deep milk chocolate color of UPS, the classic black and whites of Sees Candies and the bright orange and purple of FedEx are examples of proper color use in a brand. We primarily use a distinctive PMS 717(orange) for our corporate branding. Please take our poll and vote on which company has best color identification. 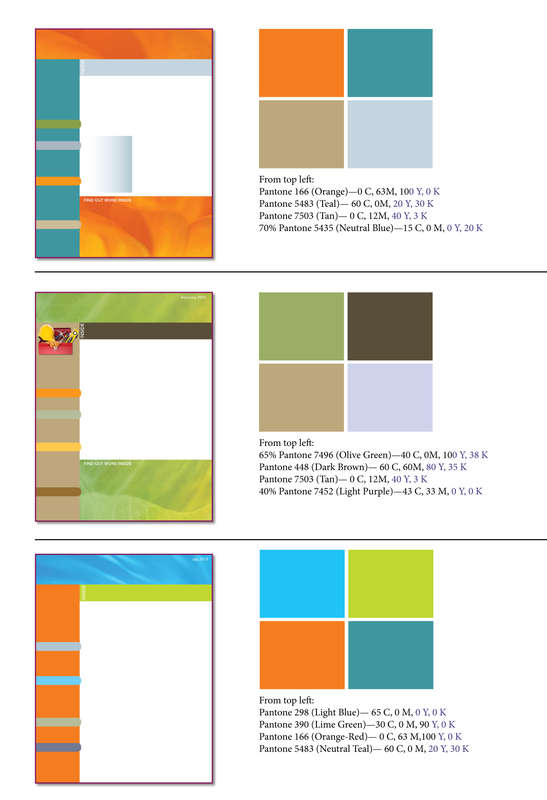 When working on a 4-color client newsletter, we provide several color options for each issue. This allows the client to get a good idea of how the layout will look once the text and photos are added. For 2-color newsletters, we provide color JPEGs of each page to give and approximation of how the final piece will look when printed. Below, we have used a shell of one of our client’s newsletters to illustrate how color can differentiate one issue from the next. 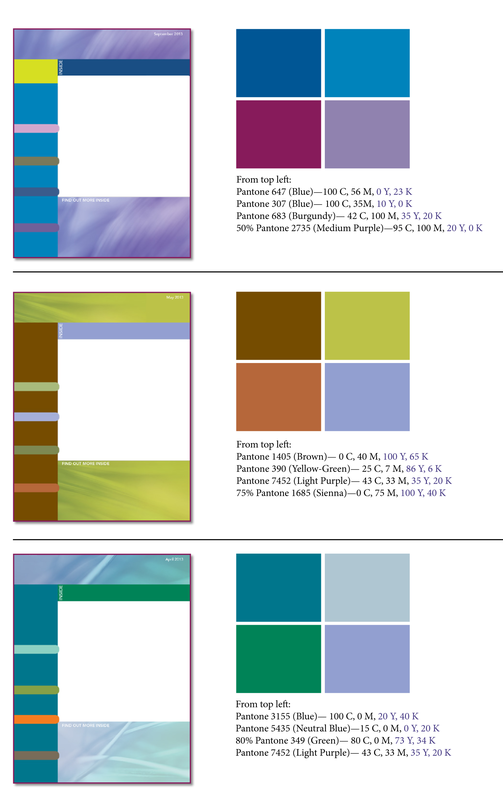 We have provided color swatches to show the different Pantone® colors and the CMYK equivalent color mixtures. 1) Use the eyedropper tool to sample colors from photos. It is best to use colors that also appear in photos to help “tie” the newsletter together. We like to make sure that the color theme of the newsletter works as a consistent and unified whole. 2) Sample colors that appear in logos or other graphics in your publications. These can be used as highlight colors. The inclusion of these colors will also help to unify the publication. 3) Pick a limited color palette. Using too much color can make a design look like a rainbow. It is a delicate balancing act to know when color is just too much. It is best to always pull back a bit and use some self-restraint. Less is more. Sometime just a hint of color can be quite elegant. In general, we like to limit a newsletter to just four main colors. The combination should include one dark color, one light color, one bright color and one neutral color. This should be a general guideline, not a strict rule. 4) Allow for contrast so that type is legible. Don’t design a large block of type in bright lime green or yellow. It is often best to make the legibility of text more important than color. After all, the publication needs to be user-friendly and inviting. 5) Test the color combination using the distribution medium. If it is a printed piece, be sure to do color proofs using the highest-end, state-of-the-art inkjet printer. If the budget allows and a true color match is critical, you may want to request a color draw down from the printer. Be sure to allow for dot-gain on press. This is where the color tends to print darker than originally envisioned and actually “gains” in density due to a combination of factors that include the ink, the printing press, the paper, dry-time and the skill of the pressman. If the final piece is an online publication, view it on various monitors and at different sizes. A blue on one monitor may appear to be a purple on another. Be sure to also view the publication on mobile devices such as smartphones and tablets. The appearance can vary greatly. A skilled design firm can make sure the end result is to your liking. Go ahead and refresh your world with some new color. New color combinations can add a whole new look to any publication. This entry was posted in Color, Corporate Communications, Corporate Identity, E-publications, Successful Corporate Communications by Successful Corporate Communications. Bookmark the permalink.